What's Next: Robots: Amazon is ramping up development on Vesta, an in-home robot that moves around the house and provides Alexa-like features, per Bloomberg. Vesta is named after the Roman goddess of the hearth, home and family, and could be in your home by 2019. Amazon says it won't comment on "rumors and speculation." Good morning. Welcome to Earnings Week. Monday: Alphabet ... Tuesday: Verizon ... Wednesday: Facebook, Twitter, AT&T, Comcast, Viacom, Qualcomm ... Thursday: Amazon, Microsoft, Intel, Baidu, Starbucks. • DOJ vs. AT&T: Justice Dept. calls rebuttal witnesses; closing arguments by the end of the month. Our colleague Hadas Gold is in the courtroom. • Cambridge Analytica: Whistleblower Christopher Wylie testifies before the House; Facebook CTO Mike Schroepfer appears before British parliament. • White House Correspondents' Dinner weekend: We'll be in Washington for the parties, brunches, gossip, scuttlebutt, etc. What's Next: Alphabet under the klieg lights. The Google parent company collects a huge amount of user data and, like Facebook, hosts a lot of controversial content, yet it has largely escaped scrutiny while Mark Zuckerberg gets put through the ringer. 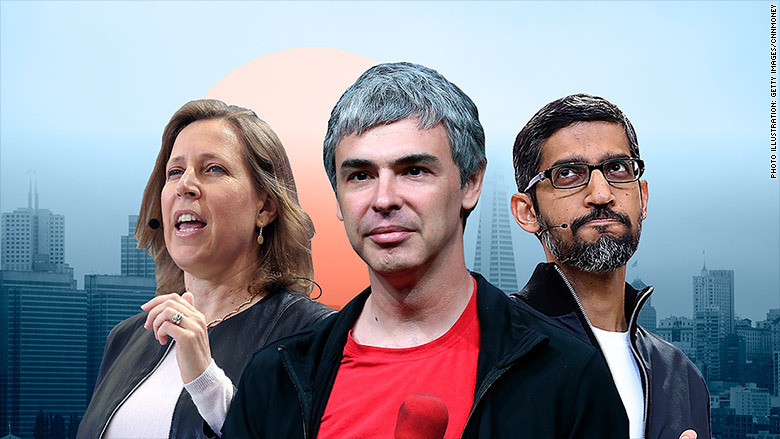 The mounting scrutiny on Alphabet and Google could force Larry Page et al to face the music. • "Google Analytics is far and away the web's most dominant analytics platform. ... Google Analytics tracks you whether or not you are logged in." • "Google also is the biggest enabler of data harvesting, through the world's two billion active Android mobile devices." • CNN's investigation found that ads from over 300 major brands and five US government agencies ran on YouTube channels promoting Nazism, white nationalists, pedophilia, North Korean propaganda and more. • Yurieff emails: "Major brands — such as Amazon, Hilton, Hershey, Netflix and Under Armour -- told us they have guardrails and filters in place to prevent their ads from appearing against content that doesn't align with their values. But it happened anyway." • Will it come up on the earnings call? : Yurieff notes Google CEO Sundar Pichai said on the last earnings call that YouTube was working to stop abuse on its platform after criticism from advertisers, content creators and users. Meanwhile ... Pichai is set to cash in $380 million this week when the shares he received before a 2014 promotion vest on Wednesday. • Facebook "forked over $3.3 million to steer lawmakers on privacy, security, online advertising, and transparency efforts, among other issues." • Goldman argues that users are not the product, seeking to rebut the favored narrative of Facebook's critics and competitors. NYT's Nellie Bowles on Facebook's Campbell Brown: "Since joining [Facebook] in 2017 to repair its frayed relationship with the news media, many have considered the former CNN and NBC anchor as as little more than window dressing. Others see her as a more insidious figure — a telegenic personality with close ties to conservative figures who can offer Facebook's outreach the veneer of journalistic credibility. ... But a year and a half into her tenure, Ms. Brown ... is emerging as a fiery negotiator for her vision of Facebook as a publishing platform." Going Public: Tencent: $25 billion IPO? • "The initial public offering, potentially coming in the second half of 2018, would be one of the largest deals of the year and ... could value the business in excess of $25 billion." • "It would be the fourth-biggest U.S.-listed tech IPO on record ..."
• "Investors are excited about Tencent Music because of its connection to Tencent Holdings ... as well as its position in the marketplace." The Big Picture: Chinese companies' power on Wall Street is driven in large part by the sheer enormity of the Chinese population. • Tencent Music has 700 million monthly active users. And you thought Amazon surpassing 100 million Prime members was impressive. Meanwhile, Spotify has around 71 million subscribers while Apple Music has just over 40 million. Apple is cutting orders of its HomePod speaker from half a million per month to 200,000 amid disappointing sales, per DigiTimes. By that measure, Apple will only sell around 2 to 2.5 million HomePods in its first 12 months of availability. • It's more expensive than other home assistants ($349). • It has far fewer features than other home assistants. @KanyeWest: "I really love my Tesla. I'm in the future. Thank you Elon." Flashback: Musk at SXSW, when asked who inspires him: "Kanye West, obviously." • "Leon has more than a binary option ... [he] can essentially force a third option, where he tells AT&T and Time Warner he'd allow the merger to proceed but only if they made certain changes to the transaction." • "One possibility ... could be an adjustment to the arbitration offer that ... guarantees Turner will arbitrate any contract disputes with distributors, like a cable company or a new streaming service, and guarantees against blackouts in which distributors lose access to certain channels during an impasse in negotiations." • "Earlier this month, Leon asked one witness ... whether he'd be open to an arbitration offer that was not as 'blind' and 'mutually beneficial, mutually fair.' That led many observers to wonder if Leon was leaning toward approving the merger, but with an altered arbitration agreement." The Big Picture: The hold up on AT&T-Time Warner is a hold up on all media M&A. What Judge Leon decides will set the terms for consolidation strategies for years to come, including media acquisitions by big tech. • CEO Reed Hastings: $24.4 million in 2017, up 5% from 2016. • CCO Ted Sarandos: $22.4 million in 2017, up 18.5% from 2016. • Reminder: Netflix says it will spend up to $8 billion on original and licensed content in 2018 and has an estimated $20+ billion in debt. What Next: "Letter from Tokyo: Japan's Rent-a-Family Industry," by The New Yorker's Elif Batuman: "People who are short on relatives can hire a husband, a mother, a grandson. The resulting relationships can be more real than you'd expect."